The 53-foot Topcon mobile solutions center, complete with a seated theatre room and product showcase area, will embark on its cross country tour starting February 13-14 in Mebane, North Carolina, then continue on to more than 28 cities in the U.S. and Canada. 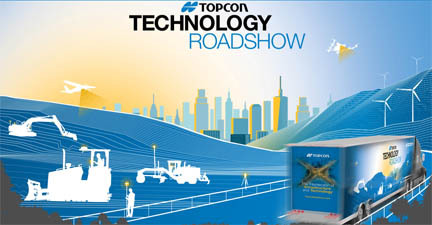 Combining the benefits of a trade show and user conference rolled up into one half day, hands-on learning environment, the Topcon Technology Roadshow will be hosted by Topcon personnel along with dealer represen tatives. The program showcases the company's latest construction, survey, civil engineering, architecture and design technologies in a hands-on educational environment. The free program features live demonstrations and presentations focused on productivity and profitability. The 2018 tour includes a schedule of multiple days in each city, plus a hands-on end-user training day offered from the Topcon Professional Services team. “We are bringing the scope of Topcon solutions to a multitude of locations with an expanded and convenient schedule along with our The Intersection of Infrastructure and Technology theme — the crossroads where construction productivity is improved by applying advanced positioning technology,” said Scott Langbein, Topcon Positioning Group director of marketing in the Americas. “Our North American market has many opportunities to address infrastructure demands. With the entire breadth of technology available in the mobile solutions center, Topcon representatives and dealers can identify an attendee’s individual needs and cater the learning experience to those business demands — all brought practically to his or her doorstep without the travel of a traditional user-conference. “We are excited to offer a new intensive training focus day to the tour throughout the U.S. and Canada. Our multi-day session approach for each stop will provide participants with more in-depth learning opportunities. We are looking forward to another great year on the road interacting with positioning professionals and students,” said Langbein.